Updated: 18th March 2017 - Updated various information and added extra sections. 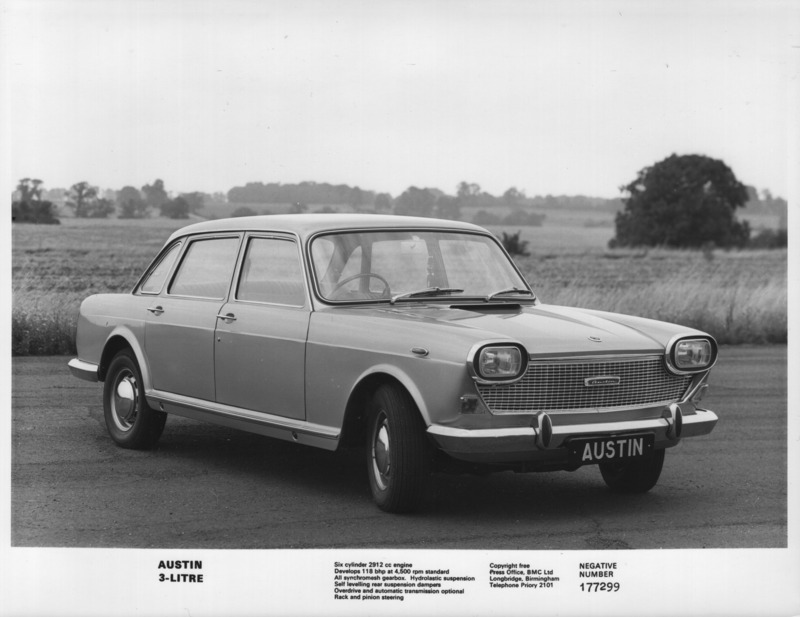 The 3-Litre (Code name ADO 61) was Austin's last large luxury car, though unfortunately for Austin it was a minor disaster. The 3-Litre was a car of opposites - On one hand it delighted - the comfort, the amazing ride quality, the nimbleness for such a huge car. On the other hand it appalled - the enormous thirst for fuel, the lacklustre engine, the outdated styling. Buyers stayed away in their thousands and the car's production run lasted only 3 years. The 3-Litre was designed in 1963 as a replacement for the Farina-styled Austin Westminster (an, indeed, the original 3-Litre press photos were titled "The Austin Westminster 3-Litre") although it was not until 1968 that the cars were to finally hit the showrooms - having dropped the "Westminster" name altogether. The car had been unveiled the previous year at the Earls Court Motor Show in London (with somewhat odd-looking rectangular headlamps) to a rather unenthusiastic audience. Even Raymond Baxter, drafted in to big the car up, couldn't generate much enthusiasm. Prior to the official launch 100 cars were given out to selected individuals so that feedback could be obtained. This feedback led to changes to the driving position, suspension, transmission and interior. 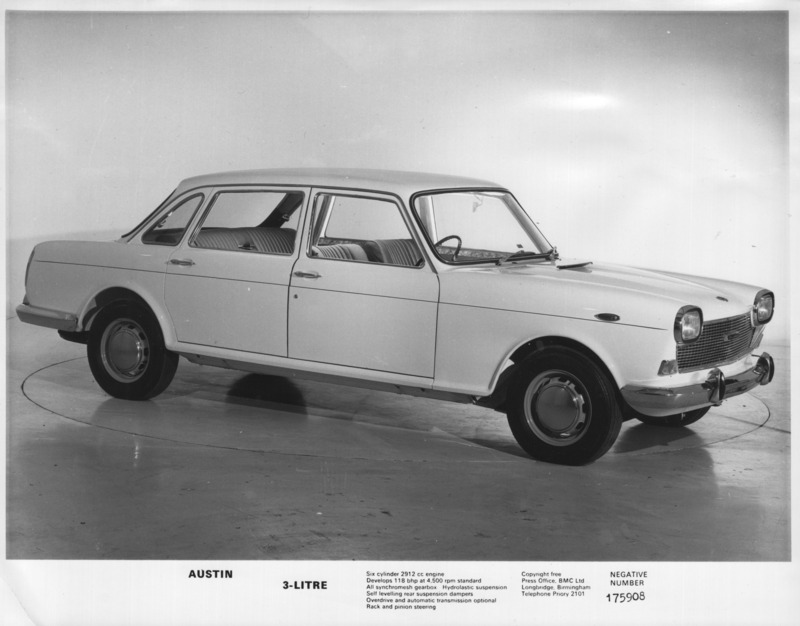 Come 1968 and the cars started spluttering off the production line; sales were not particularly good - Austin expected to sell 10,000 cars per year but less than 10,000 were sold in total, and in 1971 the car was finally given the heave-ho. Despite the car's rather frumpy styling and amazing thirst, it had a few quite revolutionary features. The car had a ride quality that no other similarly-priced car could match; this was achieved with a modified version of the Moulton Hydrolastic suspension with an engine-driven self-levelling pump to keep the car on an even-keel even with a heavy load. The suspension (jointly developed with Rolls-Royce) also meant the car retained its graceful poise even when driven hard; what the car lacked in guts (from its weedy 125BHP 6 cylinder engine) it more than made up for in road-holding and its ability to be thrown around corners in a way which would see other similarly-sized cars heading straight for the hedge. The steering, whilst perhaps lacking much feeling through the cars enormous steering wheel, was remarkably predictable. This was achieved with an all new variable-assistance steering rack - As the steering load increased, so did the assistance. The 2912CC engine (a new 7 main bearing unit shared only with the MGC) produced 125BHP - not an awful lot for such a large car - and could propel the 3-Litre to 60MPH in 17 seconds and on to a maximum speed of 100MPH (the fuel being generously sloshed in through a pair of SU 1.75" carburettors). So far I have had some bodywork sorted out by a spectacularly good coach-builder and panel-beater called John Beckley in Devon, the distributor overhauled by a company called "The Distributor Doctor" which made an equally good job, and the brake servo rebuilt by an also amazing company called "Power Track". Also the automatic gearbox has been completely overhauled (and a transmission oil-cooler fitted) by a company called Crucial Automatics in Hampshire. I can highly recommend all 4 companies (The details of which are below). GAN 21J still has a little way to go before she is tip-top - the charging circuit needs sorting out (the ammeter "pulses" wildly and I suspect a high-resistance connection somewhere in the sensing circuit or a faulty 4TR regulator), and there is still some bodywork needing sorted. "Study hard the hidden features of inner construction..."
Lapworth Garage: Old Warwick Road, Lapworth, Solihull, Warwickshire, B94 6LU: http://lapworthgarage.com/ - A highly professional and friendly service. Not the cheapest around but worth every penny - and loan cars are available. John Beckley Coach Builder: Berry Cottages, Dowland, Devon, EX19 8PD. Phone 01805 804574. (No web site.) - Classic bodywork and spraying specialist, trusted by many vintage Rolls / Bentley owners. The Distributor Doctor near Taunton, Somerset: http://www.distributordoctor.com/ - Not cheap but you'll get back an as-new distributor. MGOC Engine Spares: http://www.mgocspares.co.uk/acatalog/mgc_engine.html - The MGC engine shares a lot (although not all) of components with the 3-Litre. Check to make sure the part you want is the same first, but the MG Owners Club is happy to sell you engine bits for your Austin and they're always very quick on delivery. Crucial Automatics Ltd. in Titchfield near Portsmouth, Hampshire: http://www.crucialautomatics.co.uk/ - Specialist classic automatic gearbox place. I had my own Borg Warner 35 overhauled by them some years back and am a very happy customer. Coverdale Carpets: http://www.carcarpets.co.uk/ - An excellent range of quality and colours. Woolies Trim: http://www.woolies-trim.co.uk/ - All manner of rubber seals, fur flex, carpet, fittings and much other interior trim stuff. Classic Spares near Exeter, Devon: http://www.classic-spares.co.uk/ - Brake pads, Clutches, Bearings, Filters, Fan belts, Hoses and loads of other classic car consumables. There is some slight confusion regarding air filters for the Three Litre. Probably not helped by the fact the car never seems to be listed in any catalogues. The air filters also fit some larger-engined Vauxhalls so if you see any of those listed when you're searching then you'll know you're probably on to a winner. Here is a short list of part numbers which have been tried and will fit the Three Litre without difficulty. If you know of any others then please let me know (mike.bennett@oldtechnology.net) and I'll add them to the list. 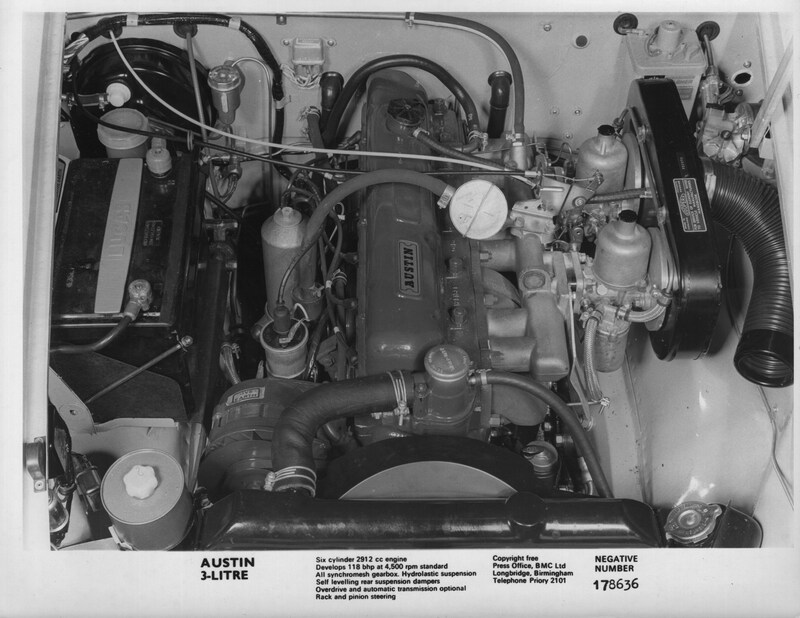 The engine from the Austin 3-Litre shares a lot of common components with the MGC (including an identical block and cylinder head). 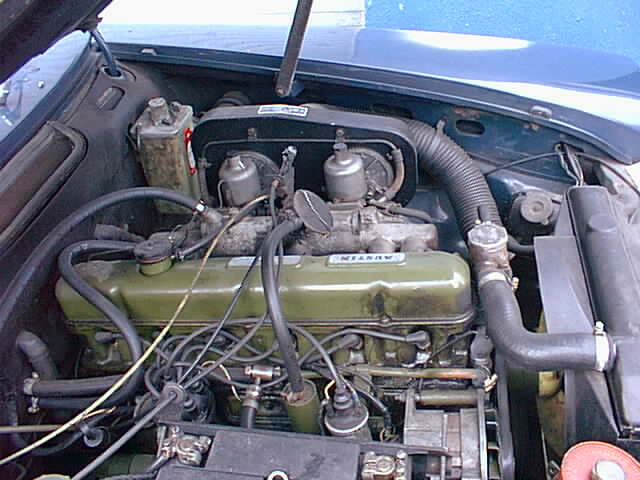 The main differences are that the MGC has a different camshaft and different pistons (although later Austin 3-Litres did have flat-top pistons the same as the MGC). Some of the fittings such as the sump case / heating / cooling / oil filter / ignition coil arrangements as well as things like engine mountings are different between the two cars as well but virtually all consumables such as gaskets etc. will be exactly the same. 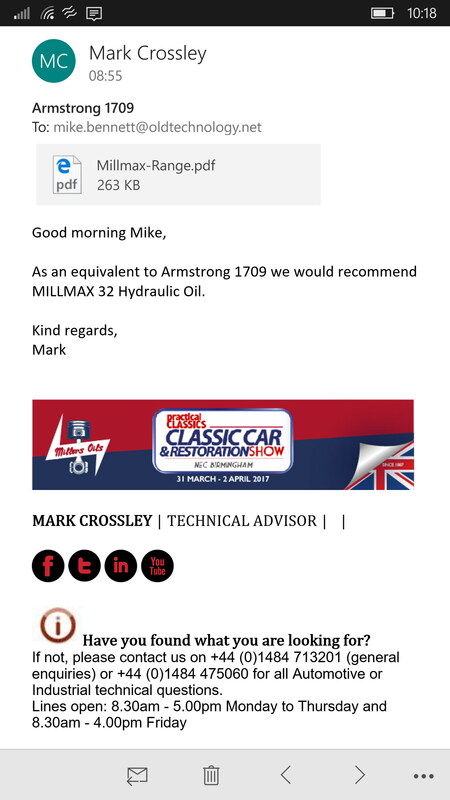 Engine components for the MGC are easily available from places such as the MG Owners Club (see above in the "Links to recommended suppliers" section). 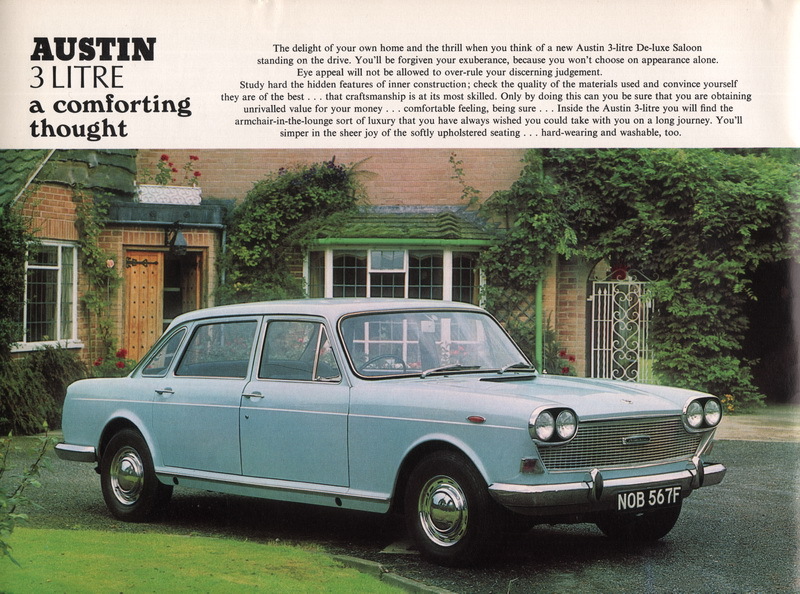 The front combined indicators and sidelights are the same as the Mk1 Austin 1800. The part number for both sides being Lucas L731. The side repeater lamps are the same as the Wolseley Six and Wolseley 18/85 and can sometimes be found on eBay. These have the part number of Lucas L735. The lenses seem to be most commonly available although it's usually the metal part that tends to corrode or the captive bolts which snap off when trying to remove them. The metal rear number plate lamp / reversing lamp assembly is shared with the MK1 Maxi, and is very similar to various Triumph models too (Stag, TR6 , Dolomite) - although the Triumph version doesn't have the cut-out for the reversing lamp. The rubber seal for the Triumph version is virtually identical to the Austin 3-Litre / MK1 Maxi but you'll need to make a couple of small rubber triangles from an old hot-water-bottle to block the light from the number-plate lamp shining through to the reversing lamp cutout. The seal has a part number of "215823" and can be bought from here. 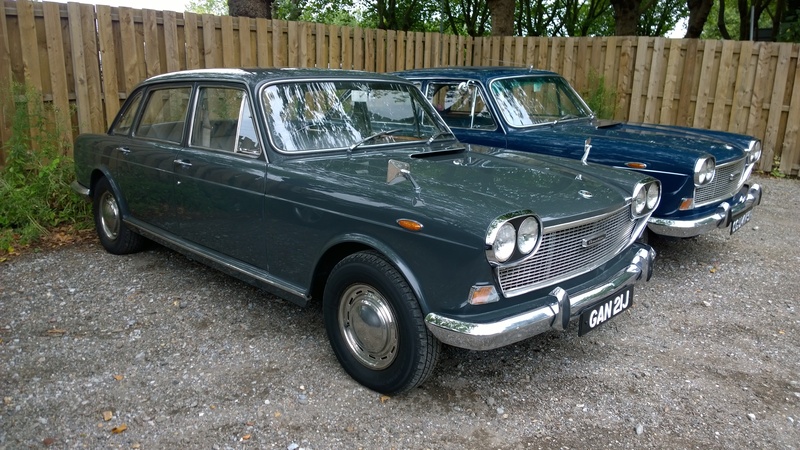 The front bumper is the same as the Wolseley Six and Wolseley 18/85 (although not the Austin / Morris 1800 / 2200). The Three Litre / Wolseley bumper is fractionally longer at the wraparound and can be identified easily by the lack of bolts at the extremities. 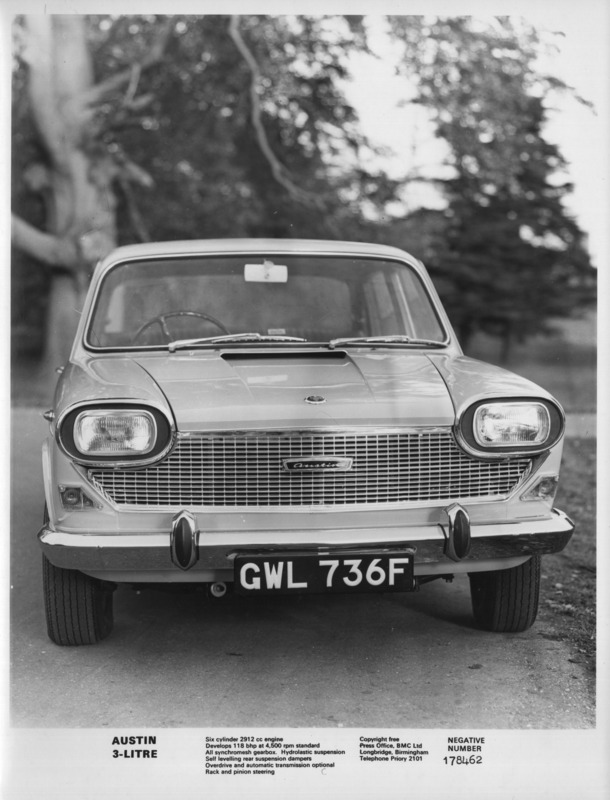 (The Austin / Morris 1800 has coach bolts at the ends but the Three Litre / Wolseley bumpers connect to the body from the other side with a captive nut on the inside of the bumper.) The Wolseley Six bumper doesn't have the over-riders, although the holes are there and over-riders are easily fitted. 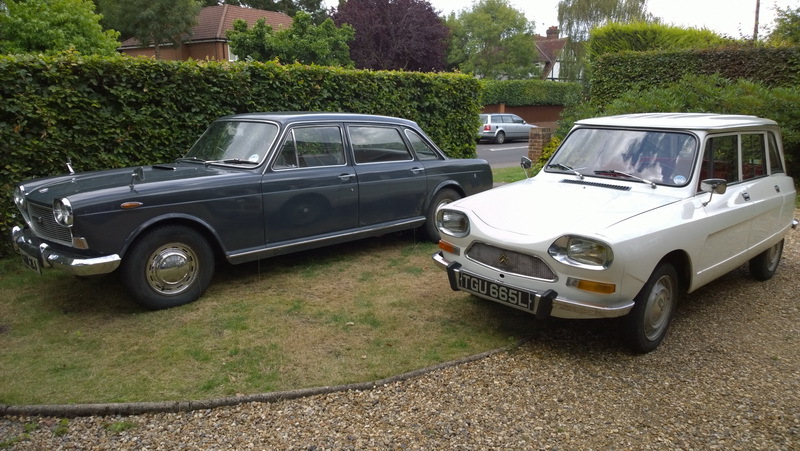 Over-riders were an optional or after-market fitment for Austin / Morris 1800s / 2200s and Wolseley Sixes - and they do turn up on eBay from time to time (as do the separate rubber buffers). The Three Litre's rear bumper is not shared with anything else and these are pretty rare commodities now. The bumper is split into three sections and it's normally the end-pieces (quarter bumpers) that corrode badly when mud gets thrown up from the back wheels and gets in behind the mounting brackets. The centre bumper is just as rare although luckily they don't seem so inclined to rust and can be re-chromed fairly easily. Below is some data from the manual which might be useful at a glance (See also under "Downloads" for more information). 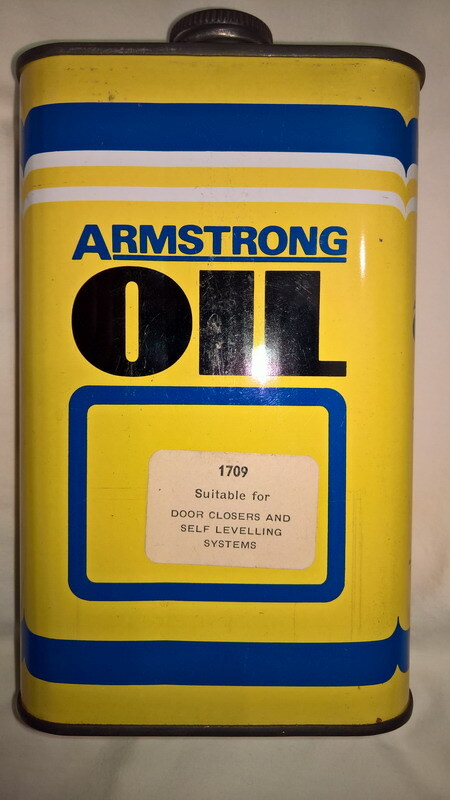 Oil (Borg Warner 35 Automatic Gearbox): If using original BW asbestos friction material then use Ford M2C-33F/G ATF (use Dexron II at your peril!). If later friction material (i.e. if the transmission has been overhauled and uses non-asbestos friction material) then use Dexron II ATF such as Castrol ATF Dex II (don't use the Ford stuff). If in any doubt, ask the people who overhauled the 'box. 1970 "Which" magazine review - BMC Big Cars - Including the Austin 1800, Wolseley 18/85 and the Austin Three Litre. 1969 "Autosport" magazine review - Downton-modified Austin 3-Litre. 1968 "Motor" magazine review - Austin Upgraded. 1969 "Punch" magazine advert - Possession is nine points of the law. 1968 "Autocar" magazine advert - Moulton Hydrolastic Suspension. 1967 "Motor" magazine advert - Pressed Steel Fisher. A 2015 photograph of two 3-Litres. *NEW* A nice outdoor side-on press photo of an early 3-Litre. *NEW* A slightly frumpy-looking front-on press photo of an early 3-Litre. *NEW* An indoor-shot press photo of an early 3-Litre. Workshop Manual - 00 - Data, Lubrication and Maintenance. Workshop Manual - 14 - Electrical. Ignition / Charging Diagram and Bulkhead Plug Wiring Chart.